A Wonderful Wine Book - Wine Folly Magnum Edition - Write for Wine: It's Wine O'Clock Somewhere!Write for Wine: It's Wine O'Clock Somewhere! We met Madeline (aka @winefolly on social channels) at wine events over the years. She is a sommelier in addition to being a wine writer and visual designer. So we are not surprised to find this magnificent book is chock full of easy-to-read information and illustrations to help you navigate the wine world. If you have ever felt overwhelmed by the abundant choices available in a wine store or in the wine aisle, this book is for you. If you’ve ever felt intimidated by other people’s knowledge of wine and wanted to know more, this book is for you. Or if you simply love to read about wine, get your copy today. You can also read about wine etiquette, wine glasses, wine cellars, wine-making techniques, acidity, tannins, wine aromas and wine faults such as cork taint, brettanomyces and oxidation. 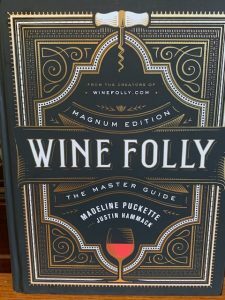 Whether you want a deep dive into these subjects or just quickly find an answer to a wine question, Wine Folly Magnum Edition has you covered. In the name of transparency, we received a free copy from Avery Books/Penguin Random House. After just a quick glance, we were hooked, and this guide is now on display in our wine room for our friends and family to enjoy too. This entry was posted in Wine, Wine Country, Wine Events, Wine Products and tagged wine, wine education, Wine Folly, Wine Folly Magnum Edition, wine pairing, wine regions, wine tasting by Margot. Bookmark the permalink.